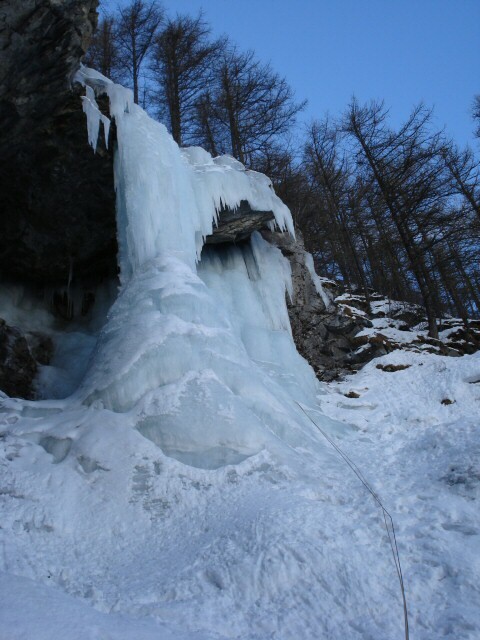 We went up to Valseuses for a look and Ron began the climb but the ice was fragile and he wasn't too happy about the ice screws. The temperature was quite mild and even though we were on the north facing side of the valley, there was a lot of water running down alongside the route. A skiing day next and we all go to Alpe d'Huez. This was partly to look at the ice routes there but also because there are some great ski runs down from Pic Blanc (3330m). The weekend past by and we were tempted by La Meije so we all went up on the cable car and had two great runs down from the top to the first cable car station, down snowy couloirs and through the trees. Our third and last run down from the top took us all the way down to La Grave.